You must sign into your myHangout account in order to contact Tom Berghan. Angelina Baker as written by Stephen Foster. This was a minstrel show tune performed by Christy’s Minstrels. It is always touchy to perform a song whose subject matter deals with slavery. I offer it with the utmost respect and reverence. It is a chapter in the American story. As I interpret it, it is a touching story of an old slave, who, in his younger years fell in love with the beautiful Angelina Baker. At the story’s end she is sold to another plantation and he is left to weep, but taking solace in playing his old jawbone. Note: The jawbone, a popular percussion instrument, was made by drying the jawbone of a donkey. With the flesh gone the teeth rattle when struck with a stick, and the side of the mandible can be rubbed with the stick to produce a kind of snare like sound. 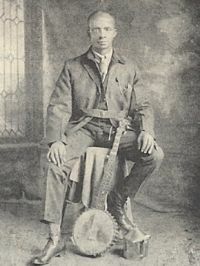 Tom Berghan Clawhammer - Banjo: Double C, Guitar: Open C - - Joe Coleman, a shoemaker, was accused of stabbing his wife to death near the town of Slate Fork, Adair County, Kentucky, as recorded in the Burkesville Herald Almanac for 1899. Convicted on circumstantial evidence and the testimony of his sister-in-law who was living with them at the time, Coleman was tried in nearby Cumberland County and sentenced to death. While being driven to the place of execution in a two-wheeled ox cart, Coleman sat on his coffin and played a tune that has come down as "Coleman's March." Coleman protested his innocence to the last. Also attached to the tune is the legend that before Coleman was hanged he offered his fiddle to anyone who could play the tune as well as he, and at least one source identified a Kentucky fiddler named Franz Prewitt as the recipient. Prewitt's descendants remembered him as having been indeed a fine fiddler. The tune dates back to the 18th century British Isles. It is known by various names, one being “Old Hickory” after President Andrew Jackson.